Faculty and staff on all K-State campuses are invited to register and attend a free event designed to foster better communication and understanding of K-State's military-connected students. 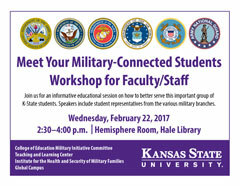 The Meet Your Military-Connected Students workshop will be from 2:30-4 p.m., Wednesday, Feb. 22, in Hale Library's Hemisphere Room. Event organizer and College of Education academic advisor Kelly Briggs explained the concept behind the event. "The goal is to promote meaningful conversations among faculty, staff and students and identify any cultural norms and administrative or educational practices that may pose challenges for the military community," Briggs said. "Military-connected students will share their experiences and provide important insights with the overarching goal of raising awareness and affecting positive change for everyone." Joe Sanders, associate professor of English, attended the inaugural workshop last year and highly encourages colleagues to attend. "This workshop is a rare, student-centered opportunity to understand better the needs of a remarkably mature, self-motivated, and growing group of our students," Sanders said. The event is co-hosted by the College of Education Military Initiative Committee, Teaching and Learning Center, Institute for the Health and Security of Military Families and Global Campus. To register, please visit k-state.edu/tlc/.